On Tuesday, October 20, Carnegie Mellon University’s Department of Statistics celebrated World Statistics Day with a pizza party for faculty, staff and students. Guests were encouraged to share statistics-themed desserts, with prizes for the tastiest treats and the most clever statistics puns. 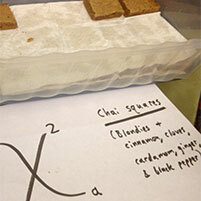 Entries included a cake decorated with a scatter plot, “model-based coconut clusters,” “Tukey lime pie” and “chai squares”—chai-spiced bar cookies named for the chi-squared distribution. The coconut clusters and chai squares tied for first place. “Data is everywhere. As a mathematics major before coming to CMU, I appreciate the real world application of math in data analysis and statistics,” Hyun said. Sponsored by the Statistics Division of the United Nations’ Department of Economic and Social Affairs, World Statistics Day offers an opportunity for universities, statisticians and others to promote the importance of data. Activities and celebrations worldwide highlight the role of sound statistical methods and improved data sources in the development of policies that impact millions of people. According to numbers released earlier this year by the American Statistical Association (ASA), statistics is the fastest-growing Science, Technology, Engineering and Math (STEM) discipline for undergraduate students. As a global leader in applying statistics to the fields of science, technology, policy and education, Carnegie Mellon has experienced even more dramatic growth in its statistics department, where the number of statistics undergraduate majors has roughly doubled since 2010 and has grown twenty-fold since 2005. CMU’s statistics program offers several paths that emphasize the connections between statistics and other disciplines. Options include joint majors with economics and machine learning; new tracks within majors in neuroscience and statistical theory; and a statistics-operations track in the Mathematical Sciences Department. CMU statistics graduates find jobs in diverse fields. The most common sectors are finance and banking, consulting and analytics, and management and marketing. About 10-20 percent of primary statistics majors have gone on to graduate or professional school, and a growing number of graduates are working in industrial research, the pharmaceutical industry, software companies and education.